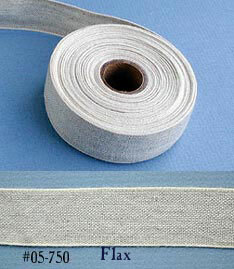 Originally trims like this, along with other linen (colloq. "linnen") goods, were routinely shipped to the American Colonies from Holland and France. Today, our no-nonsense pure linen tape comes to you in your choice of true White or a natural Flax with narrow cream colored edges. The very fine, plain weave gives it an understated elegance that never upstages your companion fabrics. Our White is indispensable for small clothes, while Flax is neutral enough to go with just about anything. When dyed, the Flax color produces rich, rustic hues. Since linen is stronger when wet, it is good for any application where clothing is close to the skin, such as on stays or corsets.